internet Vs mobile phone: rural farmers to judge! Talking about social media and ICT. Today I am helping my friend Cissy to create a Facebook page for her organization. She works with Ntulume Village Women’s Development Association (NVIWODA). In a humble setting lies the story of the Ntulume Village Women’s Development Association (NVIWODA). In June 1987 a group of women residing in Ntulume Village founded, Ntulume Village Women Development Association. NVIWODA operates in ten districts of Uganda, the organization equips women with skills, networks and shares knowledge and information with twenty seven women community based groups. NVIWODA is one of the 99 or so women organizations profiled on the WOUGNET website. Nice question – I think to myself. But the internet has not benefited the rural farmers that much when it comes to marketing their produce. The rural farmers have more or less benefited from the internet indirectly. As a matter of fact, access in rural areas remains a big challenge. Women farmers testing use of Mobile Phones to access commodity prices..
very handy tool due to its flexibility in functionality and yet doesn’t require special skills to operate. I telling her a living example on how Kubere Information Centre – a project formed by Women of Uganda Network under the Information Sharing and Networking program has helped many rural farmers over the years on how to use ICTs to access agricultural information. Kubere Information Centre works with rural farmers from Lira, Oyam and Apac. 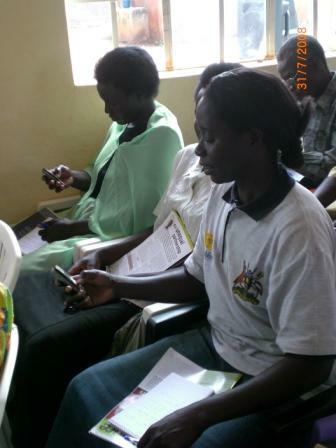 These farmers are also trained on how to use the mobile phone to access commodity prices. Apparently she is working on an idea which involves the use of a notice board. On this notice board the farmers write their market prices prior to the communal markets in their rural areas. She says once implemented this idea would help reduce on exploitation of rural farmers. She says that this idea will first be implemented in Kabarole and then to other districts. She will also use her cell phone to access the commodity prices which she will then pass on to rural farmers to write on their notice boards prior to the market day. Become a Fan of NVIWODA on Facebook! !